At this point, I think this is a bot. Three copy-pastes is too much evidence. MAYDAY MAYDAY MAYDAY FORUM ADMINS! This is RowletAlex requesting assistance! My thread is being hijacked by a copy-pasting possible bot! Weather is clear, I intend to get this thread back on track and discuss the actual concept creatures, please give them a warning or whatever else you see fit. My present position is this thread, my heading is the next page (if comments continue) Altitude unknown. Fuel remaining: 9...9...9...9...9 hours. Number of souls on board: 12, not including the potential bot. Edit: While you’re here (if you are) how does one change their profile picture (particularly from a phone, which is where I already have said profile pic ready)? @Foxy we need a hammer to hit snoutchi's bot face. Not a bad looking creature, I just wish it didn't have the features of a very stretched out sea dragon. Imagine that thing coming at you in the arctic's void. But it aint gonna exist doe. 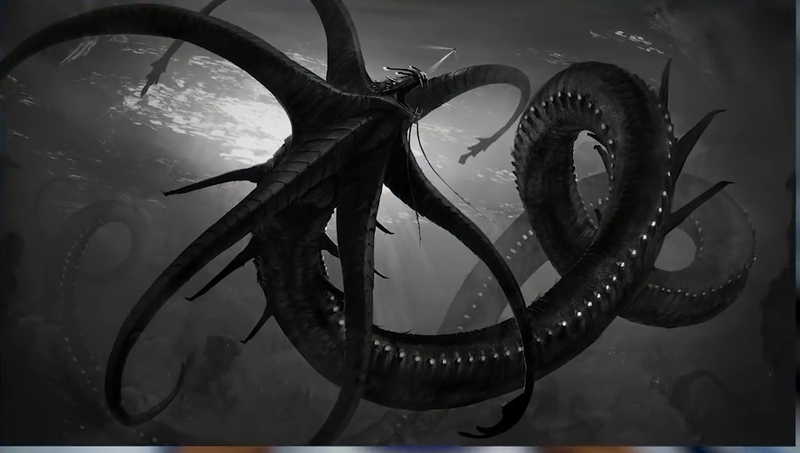 That was commissioned by a youtuber... it is an artist's conception of what the extinct lost river leviathan might have looked like - but it is nothing official! I just notice, the guy who has been copy and pasting the fan art thing. One of the sentences are missing on the last time they pasted it. So now I have a feeling it isn't a bot, and just some 6 year old spamming, or it could be a bot and they just told the bot to remove one sentence. I thought I was the only bot here! @AnomalyDetected @Avimimus I know guys, I was just commenting on the idea of it. I personally hope that color scheme A for the Pinnicarid is added, but I do like C. Also, I think the space penguins on the arctic reefback are actually a genetic relative to the first creature. By the way, most Subnautica youtubers these days, 98% of their titles and thumbnails are some form of clickbait. Like all this Atlas Submarine nonsense. It's kind of obvious that if they add an icebreaker submarine, they'll add the Manta. Ooooooh that Manta looks really cool! Edit: I now realize everyone beat me to the punch. You have to go to the desktop mode, then settings. I really like these and hope they opt to use multiple different colors of the same creature. It's not like you can't have subspecies! The messages were posted on different days. One was on the 10th, another on the 11th and two on the 12th. How does lag cause it to post over a span of 3 days. Well I don't know why it was lagging so much but I fixed it so it's all right now. Plus, I wasn't seeing the answers and google was really laggy but I'm glad I wasn't kiked because of this. Hahaha that is really cool! I 90% doubt you actually lagged for three days in a row and posted two of the same and one different message. Either way, get back on topic. In regards to the Arctic creatures, interesting. I would love to see the glow whales and Reefbacks. The Rockpuncher would be amazing too! The Rockpuncher would be amazing too! "Human! Let us start things of with some party games"
I know this concept was intended to be the P.R.A.W.N. suit at the begening of Subnautica but I think it would be cool to see a new one and this one looks absolutly awsome! I really like the one on the right!